I gave a version of this talk at the International Women's Day Celebration for Women Who Code Atlanta. I've had multiple requests from attendees to share my slides, and quite a bit of my content was in the speaker's notes, so I've written out the post below. If it resonates with you: I will be giving a much more in-depth talk on this topic in June for the inaugural WeRISE Women in Tech Conference in Atlanta. Join us! She was absolutely right, but the thought of talking to a roomful of insanely accomplished women in tech, and acting like I had anything useful to say, was, quite frankly, terrifying. How many of you have had that moment, where you feel like you have no idea what you’re doing, and that at any moment, someone will notice? My name is Aly Merritt and I have a confession to make: A lot of the time, I feel like a fraud. The trendy psychological phrase for this problem is “impostor syndrome” or "impostor phenomenon." You’ve probably heard it before. Coined by psychologists Pauline Rose Clance and Suzanne Imes in the 1970s, it describes observations during therapeutic sessions with high-achieving women. When you say it out loud, that sounds ridiculous, right? It sounds like something where you should just, well, get over it! 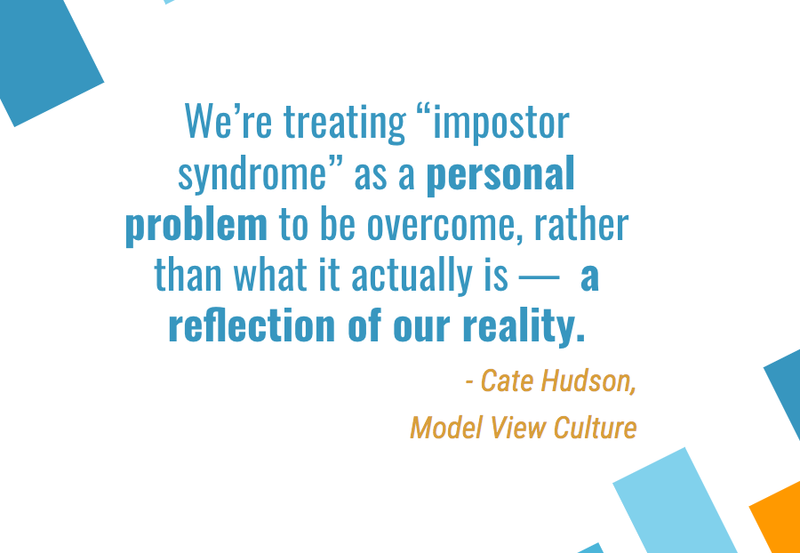 But more women, especially women of color, are pointing out that we’re treating “impostor syndrome” as a personal problem to be overcome, rather than what it actually is — a reflection of our reality, of the day-to-day discrimination and stereotyping that pervade our business culture, especially the tech culture. Is it actually paranoia, if they’re really out to get you? And if you’re out there thinking that “real” successful women don’t have this problem, you’d be wrong: Well-known, accomplished women like Sheryl Sandberg, Sigourney Weaver, and Justice Sonia Sotomayor have all publicly talked about suffering from impostor syndrome. Several months ago, I had the opportunity to moderate a panel that included several incredible women. And prior to the event, each woman individually sought me out and told me they weren’t sure they had anything to say, and that maybe they weren’t the right people for the panel. I was baffled — it was a panel on their exact area of expertise. When multiple experienced women at enterprise-level companies say they don’t have anything to contribute to a professional conversation about their own subject matter, there is a problem. Ladies, the deck is stacked against us. Only 24 percent of the total share of STEM jobs in the nation belong to women, according to the U.S. Department of Commerce. In STEM fields, men can outnumber women 5-to-1. And while the gender gap for STEM at some universities is beginning to close, specific majors such as computer science are often still more than 70 percent male. So okay. If the problem is that we feel like frauds because daily interactions with our colleagues and peers reinforce that idea, what can we do about it? The good news is, there are approaches that work. These include implicit bias training and diversity programs — um, not like the kind at Uber, but ones that actually train people in recognizing and dismantling biases. Researchers are finding new ways for recruiters to address implicit gender biases in hiring. A 2015 study found that teaching members of university hiring boards about implicit bias made those board members 6.3 times more likely to offer positions to women. Students in underrepresented minorities have been found to get better grades and take more science classes when they’re shown the bigger-picture benefits of their work. Successful diversity programs can focus on changing individual behavior by inviting people to “opt in” to new perspectives and experiences. With diversity task forces, accountability tells our brains to be more intentional about the actions it is taking because we’ll have to explain them later. This has been shown to reduce bias by, of all things, making us think harder about why we do what we do. Companies which appoint diversity managers see a 7-18% increase over the next five years in almost all underrepresented groups in management. And let’s just pause for a moment and discuss this — we cannot achieve gender equality if we’re not engaging men and including them as partners in these conversations. Gentlemen reading this: You have the opportunity to play powerful roles, especially in workplace dynamics, as our internal gender equity advocates. Knowing this and taking action to mentor, support and promote women is incredibly important. When you lead by example, others will follow. Thank you for being our allies. These are all actionable things you can take to your company, your school or even your personal life. One of the reasons I work in startups is because I feel that bigger impacts are possible there, and it’s easier to bring about change from the ground up and the inside out. For me, this includes helping with my company’s diversity and inclusion team, taking part in learning about my own unconscious biases and then assisting in culture interviews, and working to make events and groups that I’m a part of more inclusive on all fronts. If we each move the needle a little bit, together we can move the needle a lot. you are making the difference. A normal where nobody feels like an impostor, because that’s no longer the reality. Thank you for creating that new normal. Thank you for being bold for change. And thank you for helping forge a more gender-inclusive world. Join me in June at the inaugural WeRISE Women in Tech Conference in Atlanta to hear a more detailed version of this talk! Many thanks to the bloggers, researchers and journalists whose work I reference here. They have paved the way to this conversation by writing about and investigating inclusion, impostor syndrome, diversity in STEM and more.